I read a new children’s book a few days ago. 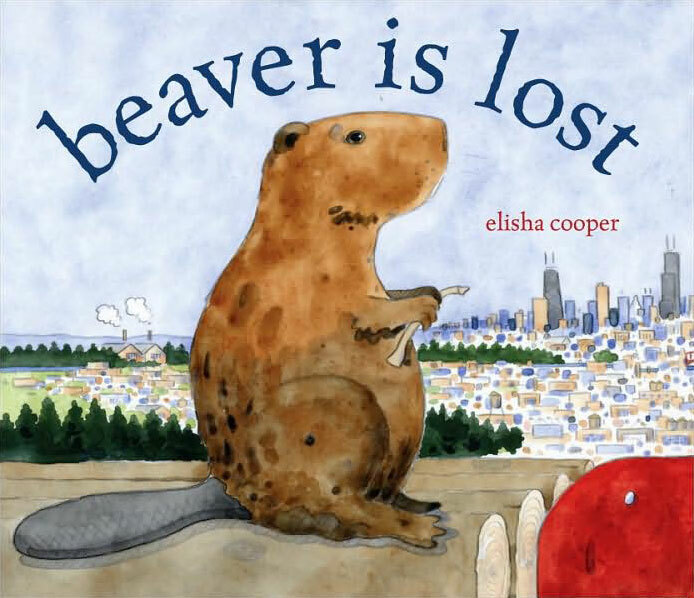 The book, Beaver Is Lost by Elisha Cooper, was nearly perfect. Pretty, being painted in watercolors; evocative; easy to read—with just four words; and enjoyable both to my two-year old son and to me. Even the author page was clever, using a picture of the city to include author and publisher information embedded in billboards. There was only one mistake: the title. It is technically accurate, as the story is about a beaver who accidentally gets lifted onto a logging truck and is driven to the city and has to navigate his way through the city and back up the river to his home and family. The true title, however, should be: People are Lost. This beautiful depiction of humanity cutting down forests and transporting massive amounts of trees to the city reveals, without a single word, how brutal our relationship with the Earth has become. Even the city—typical enough in the way it’s portrayed—but when you look close, it looks more like a cancerous growth on the landscape. Minimal life, just tumorous tissue in the form of skyscrapers, houses, and factories, displacing the living green of the surrounding trees. Of course, there is a beautiful irony that the protagonist of the story is like Homo sapiens in its ability to transform ecosystems for its own ends—arriving back home to its beaver dam. It’s just that beavers, or Castor canadensis, didn’t also learn how to eliminate or control all predators and disease vectors that prevent them from becoming so successful that they undermine their own long-term wellbeing. The question remains will humanity find its way back home to a healthy relationship with the planetary systems it depends on? Will it create new checks and balances to replace the ones we’ve so successfully erased in order to rein in further growth? Or will our future look instead like the final pages of The Lorax? With us holed up in our crumbling buildings, living in the grickle-grass wastelands of the once beautiful, now-razed, Truffula tree forests?